BLR-3 - 1937 bomber design project; cancelled, none built. 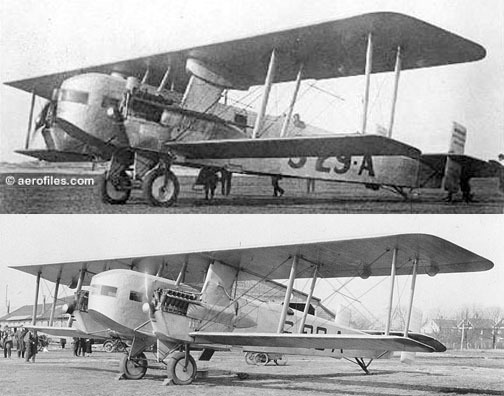 C-6, C-6A 1929 = 12pChwAm; two P&W R-1340-7; span: 71'6" length: 40'3" v: 112. Data similar to S-38A. POP: a single 12p S-38A was procured by the USAAC for evaluation as C-6 [29-406], also as Wright Field s/n XP-588eventually the ship, which had a length of 41'0", was used as a VIP aircraft. This was followed by 10 C-6A production aircraft [30-397/406], used mainly for transport duties and target towing. CH-148 Cyclone (Canada) est: 2008 - H-92 variant as replacement for Sea King. Contracts for 28 maritime helicopters in Nov 2004. Guardian 1927 = Twin-engine bomber joint project with Consolidated for Army evaluation. 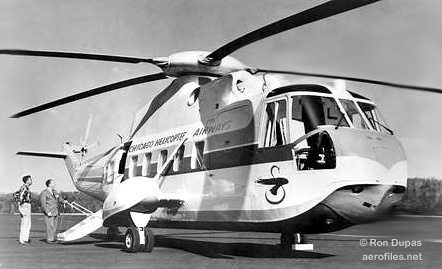 Test model, as Consolidated-Sikorsky Guardian, built by Sikorsky revealed major structural flaws in initial testing and the project was canceled. H-3 (Model S-61) - Multiservice use, derived from S-61B. CH rg; two GE T58-GE-8C/F turboshafts; six-blade main rotor: 62'0" length: 54'9" v: 160/133/0 range: 625 ceiling: 10,800'. Water-tight boat hull. USN version HSS-2. The H-3 designation was applied to various versions of the S-61 basic design, including S-61B, -61D, -61F, and -61R. Service names include Jolly Green Giant, Seaking, and Pelican, depending on the user service. 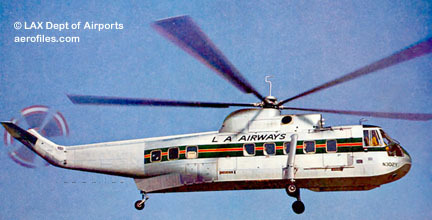 Built under license by United Aircraft in Canada as CHSS-2 and CH-124, broadly similar to SH-3A, also by Agusta (Italy), Mitsubishi (Japan), and Westland (UK). CH-3C (Model S-61R) 1963 = USAF. Originally conceived as XHR3S-1, incorporating a redesigned fuselage with aft ramp, it was ordered by the Army; ff: 6/17/63. POP: 75 [62-12561/12570, -12577/12582, 63-9676/9691, 64-14221/14237, 65-5690/5700, -12511, -12777/1280]. 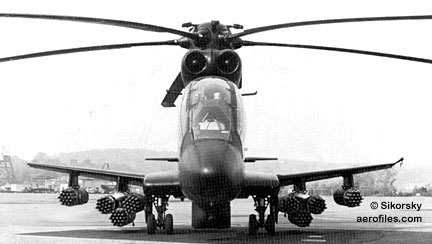 Most were later converted to CH-3E or HH-3E standards. JCH-3C 19?? = One CH-3C [62-12581] temporarily used to test de-icing equipment. CH-3E 196? = USAF and Army. CH-3C with uprated T58-GE-5 engines. POP: 42 [66-13291/13296, 67-14702/14725, 69-5798/5812], plus upgraded CH-3Cs. HH-3A 196? = USN combat SAR (Search and Rescue) in Vietnam. POP: 12 conversions of SH-3A. HH-3E 19?? = USAF combat SAR, with aft tail ramp. Notable "Jolly Green Giant" gunship of Vietnam War, capable of air-to-air refueling. POP: 11 converted from CH-3E [66-13284/13290, 68-8282], plus several CH-3Cs. HH-3F Pelican (Model S-61R) 19?? 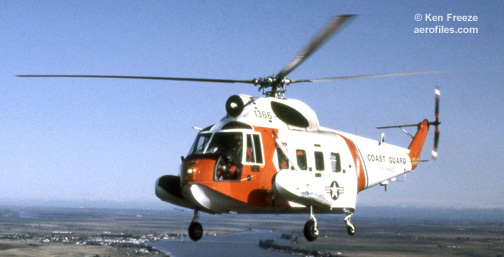 = USCG SAR, similar to HH-3E. POP: 40 [1430/1438, 1467/1497] plus 12 USN [158847/158858]. RH-3A 1965 = USN minesweeper, the only H-3 to have cargo doors on both sides; ff: 2/2/65. POP: 12 conversions of SH-3A, of which some became UH-3A drone targets. RH-3D 196? = USN minesweeper; repowered RH-3A. SH-3A, YSH-3A Sea King 19?? = USN anti-sub warfare. Set world helicopter speed record of 192.9mph on 5/17/61 (p: P L Sullivan and B W Witherspoon). POP: 251 (?>245) [148038, 152104/152139, 153532/153537, et al], of which 1 converted with a modified fuselage to S-61F, 3 as CH-3B, and 3 to USAF as NSH-3A [62-12571/12573]. SEE ALSO HSS-2. A highly modified SH-3A set a world helicopter speed record of 210.64mph on 2/5/62 (p: R Grafton). SH-3D, VH-3D 19?? = USN anti-sub warfare with T58-GE-10 engines. POP: 72 [prototype 152139, 152690/152713, 154100/154123, 156483/156506, 158724/158725, 158874/158875, 159026/159029, 159053/159056, 161207/161212]. In addition, several SH-3As were converted to this standard [148998, 151544, 152139, 153532/153537]. 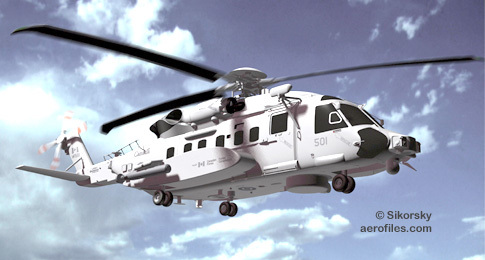 VH-3D referred to a conversion. SH-3G 19?? = USN SH-3A and -3B converted to utility configuration. 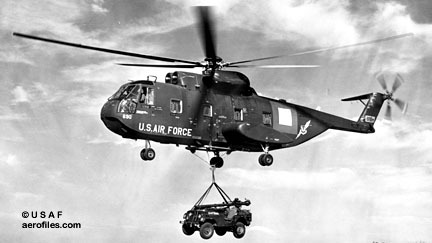 POP: 105; further modified as SH-3H and UH-3H. SH-3H 19?? = USN multipurpose version of SH-3G with new anti-sub warfare equipment fitted. UH-3A 1965 = USN drone target. POP: unk. VH-3A, -3C 1962 = USMC presidential transport; ff: 9/18/62. Originally designated as HSS-2Z. POP: 8 modifications [147141, 150610/150617], and 11 new production [159350/159360]. YSH-3J 19?? = Conversion of 2 SH-3Gs as prototypes for the LAMPS III program. H-7 - Cancelled development of XR-6. H-18 1945 = First US Army helicopter, based on commercial S-52. 4pCH; 245hp Franklin O-425-1; rotor: 33'0" length: 28'10" load: 1050# v: 100/92/0 range: 358 ceiling: 15,800'. Quad landing gear. POP: 4 as YH-18A [49-2888/2891], of which 2 converted as XH-39/-39A test-beds. H-19 Chickasaw - 12pCH, USAF version of S-55. Quad landing gear; engine located in the nose. Became armed after 1950 tests at Ft Rucker. MATS Air Rescue versions designated SH-19B became HH-19B. USN versions HO4S, HRS. 547 license-built by Mitsubishi, Sud Aviation, and Westland. YH-19 1949 = 550hp Wright R-1340-S1H2; ff: 11/7/49. POP: 5 [49-2012/2016]. H-19A, SH-19A 1951 = 600hp R-1340-57; rotor: 53'3" length: 42'1" v: 115/90/0. POP: 55 [51-3846/3895, -17662/17666], of which 1 to Army for evaluation. 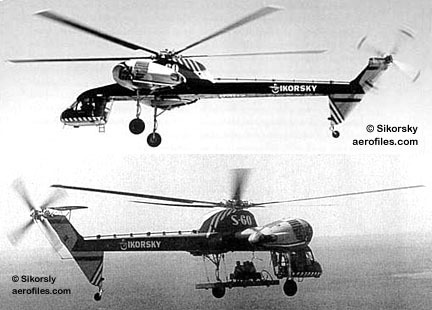 Some converted to Air-Sea Rescue SH-19A and HH-19A after 1962. H-19B, SH-19B, UH-19B 1951 = 700hp Wright R-1340-3, new tail design; rotor: 53'0" length: 42'3" load: 2650# v: 112/91/0 range: 360. POP: 270 [51-3896/3968, 52-7479/7600, -10991/10994, 53-4404/4464, -4878/4885, 56-6673/6674], of which many converted to Air-Sea Rescue SH-19B and HH-19B after 1962. Redesignated as UH-19B in 1962. H-19C, UH-19C 1952 = 600hp R-1340-57; load: 2705# v: 101/85/0 range: 450 ceiling: 10,500'. POP: 72 to US Army [51-14242/14313]. Redesignated as UH-19C in 1962. H-19D, UH-19D 1952 = 2p with up to 10 troops or 8 stretchers. 700hp Wright R-1340; load: 2650# v: 112/91/0 range: 385 ceiling: 12,500'. POP: 336 [52-7601/7625, 54-1408/1437, 55-3176, -3183/3228, -4937/4944, -4462/4504, -5235/5240, 56-1519/1568, -4246/4283, 57-1616/1641, -2553/2558, -5926/5982], of which 61 were exported to friendly nations. Redesignated as UH-19D in 1962. CH-19E = Redesignated from HRS-3 in 1962. UH-19F = Redesignated from HO4S-3 after 1962. HH-19G = Redesignated from HO4S-3G after 1962. 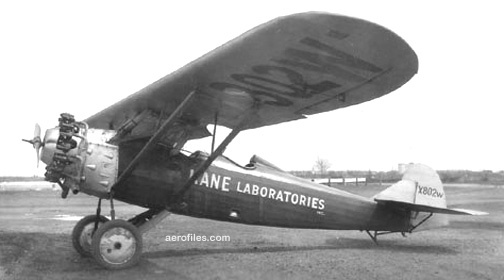 H-34 Choctaw - Similar to civil S-58 with 1425hp Lycoming-Wright R-1820-84. Originally designed for anti-sub patrol as USN XHSS-1; ff: 3/8/54. H-34A, CH-34A 1954 = 20p or 2p + 8 litters. Data same as S-58A. POP: initial order of 10 after evaluation of XHSS-1; subsequent production orders totalled 427 [53-4475/4554, 54-882/937, -2860/2914, -2995/3050, 55-5241/5261, 56-4284/4342, 57-1684/1770, 58-1721] included 21 transfers from USN. Redesignated as CH-34A in 1962. In addition to redesignated ships, 21 H-34As were rebuilt as CH-34C. JH-34A 19?? = POP: 1 [53-4475]. VH-34A 19?? = Presidential staff transport conversion. POP: unk. H-34B, CH-34B 1960 = H-34A conversion. POP: unk. Redesignated as CH-34B in 1962. H-34C, CH-34C 195? = SAR modifications. POP: unk [56-4305, -4331, -4333, 57-1692, -1698, -1709, et al]. Redesignated as CH-34C in 1962 along with 21 rebuilt and reserialed H-34As [63-13190/13210]. VH-34C 19?? = Staff transport conversion. HH-34D, UH-34D 19?? = POP: 23 to USAF for export to friendly nations [63-8248/8259, -13006/13014, -13139/13140] and 44 to USN [152686, 153116/153133, 153556/153558, 153695/153704, 154045, 154889/154902, 156592/156598], of which 10 went to USAFR as HH-34D with new s/ns [60-6913, -6923, 61-4488/4491, -4529, 63-7972/7974]. SH-34G 19?? = Export to Germany. POP: 1 . SH-34J, HH-34J 1962 = USN production. POP: 11 [151729/151731, 152380/152381, 153617/153622], of which several transferred to USAF as HH-34J. H-37 Mojave - US Army heavy transport version of S-56 with similar specs. YH-37A 1953 = Ex-USMC XHR2S-1 for testing; ff: 8/18/53. 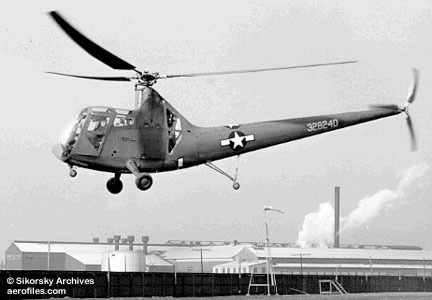 H-37A, CH-37A 1954 = First production. POP: 94 [54-993/1001, 55-610/650, 57-1642/1661, 58-983/1006]. Redesignated as CH-37A in 1962. H-37B 195? = All but 4 of the H-37As modified with new cargo door. H-38-SI - Sikorsky's mystery plane, believed by historians to have been a helicopter of unknown design that was supplied to a foreign power, and wore USAF s/n [54-4047]. H-39 1954 = US Army's evaluative conversion of H-18 to turbine power. 4pCH rg; 400hp Turbomèca XT51-T3; rotor: 35'0" length (fuselage): 41'0" (?>30'3") load: 1256# v: 146/138/0 range: 280 ceiling: 17,900'; ff: 6/1/54. Unarmed test-bed with four-blade rotor, inward- and forward-retracting gear. POP: 2 as XH-39A and XH-39 [49-2890/2891 respectively]. World helicopter speed record of 156mph on 8/26/54 (p: Bill Wester), soon after also set a world's helo altitude record of 24,521'. Civil counterpart was S-59. H-52 Seaguard 1962 = USCG SAR version of S-62 with similar specs. Originally ordered on 6/21/62 as HU2S-1G. POP: 99 as HH-52A [1352/1379, 1382/1413, 1415/1429, 1439/1450, 1455/1466]. H-53 - Multi-service 3-40pCH; two and three 2850hp GE T64-GE-3 turboshafts with 72'3" six-blade rotor (except H-53E) and tail rotor from S-64; length: 67'2" v: 170/x/0 range: 257. Watertight hull. S-80 was export "international" version. CH-53A, NCH-53A Sea Stallion 1963 = USMC 40p assault transport. GE T64-GE-3/-6/-12 turboshafts; POP: 139 (?>143) [151686/151701, 152392/152415, 153274/153313, 153705/153739, 154863/154888] and [63-13693/13694], of which 15 transferred to USN as RH-53A and 9 to USAF [66-30047, -30049, -30050, 67-30043/30046, -30048, -30051]. went to FAA as NCH-53A and wore a civil license. YCH-53A Sea Stallion 1964 = USMC assault transport; v: 200+/x/0; ff: 10/14/64. Demonstrated ruggedness of design by flying with three of six main rotor blades removed, also performed a barrel-roll. POP: 2 [151613/151614]. RH-53A Sea Stallion 1971 = USN minesweeper, with T64-GE-413. POP: 15 transfers from USMC CH-53A [152392/152398, et al]. TH-53A 1988 = Ex-USMC batch to USAF. POP: 11 [66-14468/14478]. HH-53B Super Jolly 1967 = 6p USAF armed and armored rescue. Equipped with retractable in-flight refueling probe and auxiliary fuel tanks. 3080hp T64-GE-3; ff: 3/16/67. POP: 8 [66-14428/14435]. CH-53C Super Jolly 196? = As HH-53C, but in transport roles. POP: 20 [68-10922/10933, 70-1625/1632]. 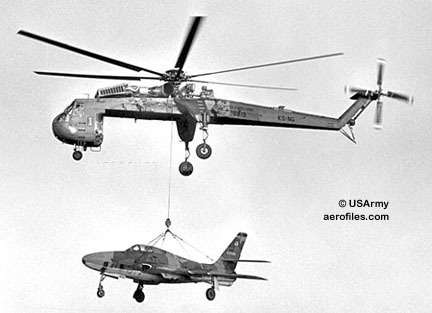 HH-53C 1967 = Space capsule recovery and combat SAR. Similar to HH-53B, but with 3925hp T64-GE-7 and jettisonable fuel tanks. POP: 44 (?>58). CH-53D Sea Stallion 1969 = USMC transport. Two 3925hp T64-GE-413 turboshafts; ceiling: 21,000'. All but the first 34 had fittings to operate as minesweepers. POP: 256. RH-53D, NRH-53D Sea Stallion 1972 = USN Airborne Mine Countermeasure (AMCM) helicopter, with two T64-GE-415; ff: 10/27/72. POP: 30. Eight -53Ds were used in the failed attempt to rescue the hostages held by Iran in 1980; seven were destroyedinterestingly, six had been sold to the Iranian Navy in 1978. Some ships used for tests were designated as NRH-53D. A story told in AMCM community is that this was the one helicopter, designed at the insistence of USN, that Igor Sikorsky was not proud of and did not have model of it displayed in his office. VH-53D Sea Stallion 19?? = USMC staff transport. POP: 2. CH-53E Super Stallion 1980 = 3pCH (2 pilots + 1 crew). Three 4380hp T64-GE-416 turboshafts with seven-blade 79'0" main rotor; v: 195/x/0 range: 56 with 16 tons external cargo (575 with 10 tons) ceiling: 18,500'; ff: 12/13/80. POP: 103. Specifically designed for USN/USMC, carried 55 troops. Heaviest-lift helicopter in service outside of USSR. Carried two 650-gallon fuel tanks on sponsons; in-flight refuelable. JCH-53E, NMH-53E 19?? = Designations for test aircaft. YCH-53E Super Stallion 1974 = Three 4380hp GE T64-GE-415 turboshafts with seven-blade 79'0" main rotors; length 73'9" v: 195/172/0 range: 306 ceiling: 18,500'; ff: 3/1/74. In-flight refueling. POP: 2 prototypes. The first one hovered at 50' at a gross weight of 71,700# on 8/10/74, carrying an external load of 17.8 tons, the heaviest gross weight ever flown and heaviest payload ever lifted by a helicopter in the western world. MH-53E Sea Dragon 1983 = 3p USN/USMC AMCM, day or night; primary minesweeper. Large, side-mounted fuel tanks in lieu of drop tanks; two 4380hp T64-GE-416; ceiling: 27,900'. POP: 35. In-flight refuelable. VH-53F 1972 - Proposed Washington-based VIP transport. Order for 6 cancelled. CH-53G 19?? = VFW-Fokker license-built version of heavy-lift CH-53D with T64-GE-7 for German armed forces. POP: 2 pattern aircraft built in US, 110 in Germany. HH-53H Super Jolly 1975 = USAF 24-hour, all-weather SAR in PAVE LOW program. 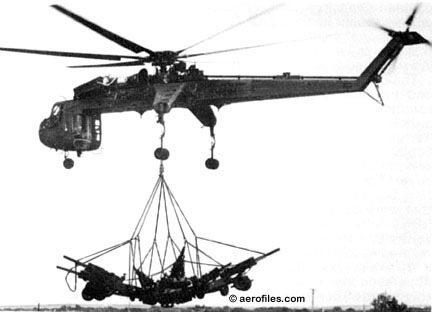 POP: 1 prototype and 8 conversions of HH-53C in 1979. 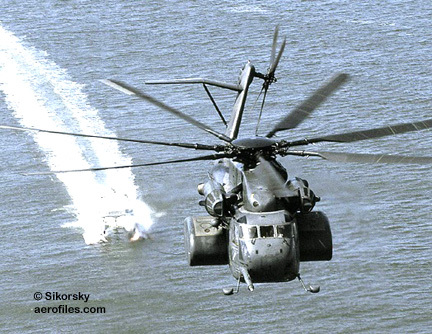 MH-53J PAVE LOW IIIE 1981 = Heavy-lift, all-weather, long-range, undetected penetration. 8pCH; two 4330hp GE T64; rotor: 72'0" length: 92'0" v: 165/x/0 range: 630 ceiling: 16,000'. Max take-off weight: 46,000#. Largest and most powerful helicopter in USAF at the time, and most technologically advanced helicopter in the world. PAVE low-level terrain-avoidance radar and forward-looking infrared sensors (FLIR), along with a projected map display, enabled pilot to follow land contours and avoid obstacles. In-flight refuelable for unlimited range. H-54 Tarhe - US Army version based on S-60. CH-54A 1962 = Two P&W T73-P-1; rotor: 72'0" length: 88'6" v: 126/x/0; ff: 5/9/62. POP: 6 preproduction as YCH-54A [64-14202/14207] ([64-4256] probably is a cancelled order) and 54 production [66-18408/18413, 67-18414/18431, 68-18432/18459]. CH-54B 1970 = Heavier 45p version with dual main wheels and two T73-P-700. POP 37 [69-18460/18484, 70-18485/18490, 71-18491/18498]. 22 universal carrier pods, 27'5" long and 8'10" wide, used by these aircraft were serialled separately [68-18578/18599]. H-60 (Model S-70) - Multiservice utility CH with two 1560hp GE T700-700 in most UH-60s, and 1690hp T700-401 in most SH-60s, and other engines as specifically mentioned; four-blade main rotor: 53'8" length: 64'10" v: 190/160/0 ceiling: 19,300'. Export sales to Australia, Bahrain, Brunei, China, Colombia, Egypt, Greece, Israel, Japan, Jordan, Mexico, Morocco, People's Republic of China, The Philippines, Saudi Arabia, South Korea, Spain, and Turkey. CH-60 19?? = USN version of UH-60L. SH-60 19?? = Exports to Australia, Greece, Japan, and Spain. UH-60 19?? = Natl Guard. EH-60A, YEH-60A Black Hawk, Quick Fix II 1981 = US Army communications intelligence. UH-60A conversions; ff: 9/24/81. POP: 1 prototype as YEH-60A [79-23301] and ?? production [84-24017/24028, 85-24465/24482, 86-24561/24578, 87-24657/24674]. HH-60A Night Hawk 1984 = USAF combat SAR; two T700-GE-700/-401; ff: 2/4/84. POP: 10 stock UH-60As. MH-60A Black Hawk 19?? = US Army Special Operations; two T700-GE-701C. UH-60A, YUH-60A Black Hawk 1978 = US Army, Natl GUard, US Customs Service, export. 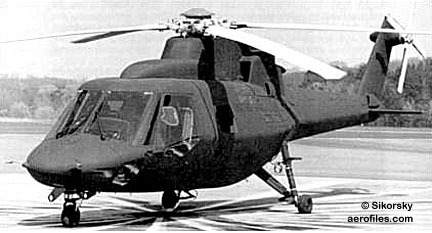 POP: 6 prototypes (T700-GE-700; length: 41'4"; ff: 10/17/74) in 1974 as YUH-60A [73-21650/21655], converted to UH-60A, and 1,509 production (ff: 10/17/78) [77-22714/22728, 78-22960/23016, 79-23263/23354, -23369/23370, 80-23416/23509, 81-23547/23626, 82-23660/23761, 83-23837/23932, 84-23933/24016, 85-24321, -24387/24464, -24745/24750, -25511/25512, 86-24483/24560, 87-24579/24656, 88-26000/26005, -26015/26122, 89-26123/261785, 91-26319/26392, 92-26393/26400]. JUH-60A 19?? = POP: 75 conversions of UH-60A [78-22976/23012, 82-23748, 86-24507/24543]. NUH-60A 19?? = POP: 1 conversion of UH-60A [77-22717]. VH-60A White Hawk 1987 = USMC executive transport version for the White House; ff: 10/6/87. POP: 9 [163259/163267]. EH-60B, YEH-60B Black Hawk, SOTAS 1981 = US Army "Stand-Off Targeting and Surveillance." Superseded by J-STARS. POP: 1 prototype converted from UH-60A as YEH-60B [78-23013]; production cancelled. SH-60B, NSH-60B, YSH-60B Sea Hawk 1979 = USN outer-zone anti-sub warfare with sonobuoys, surface search radar, magnetic anomoly detector (MAD), and datalink; ff: 12/12/59. POP: 5 prototypes as YSH-60B [161169/161173]; production as SH-60B in 1983 [161553/161570, 162091/162139, 162326/162349, 162974/162991, 163038/163043, 163233/163258, 163593/163598, 163905/162910, 164174/164179, 164461/164466, 164808/164819, 164847/164858, 165095, 165106/165112]. Some aircraft used for tests as NSH-60B. EH-60C, UH-60C Black Hawk 197? = US Army battlefield command and control. Upgraded EH-60A. POP: ?? [85-24480, 87-24660, 87-24670, et al]. HH-60D Night Hawk 1984 = USAF combat SAR, conversions of UH-60A. POP: 2 prototypes [82-23718, 82-23728], production cancelled. UH-60D 19?? = POP: 11. VH-60D 19?? = Executive transport. POP: unk. HH-60E Night Hawk 19?? = Simplified version of HH-60D. POP: unk. SH-60F, YSH-60F Ocean Hawk 1987 = Carrier-based, inner-zone, anti-sub warfare with dipping sonar and datalink; ff: 3/19/87. POP: -- [163282/163288, 164069/164104, 164423/164440, 164443/164460, 164609/164620, 164796/164804, 165113/165119, 165268/165270]. Scheduled for conversion to HH-60H in 2002 (prototype ). One aircraft was used as YSH-60F to test a vectored-thrust ducted propeller. HH-60G Pave Hawk 1986 = USAF combat SAR. POP: 8 conversions from HH-60A [97-26772/26779]. MH-60G Pave Hawk 1990 = US Army Special Ops (SEE PAVE sidebar). POP: ?? converted UH-60A [82-23680, -23689, -23708, -23728, -23761, 88-26006/26014, 90-26222/26239, -26309/26312, 92-26401/26407]. HH-60H Rescue Hawk 1988 = USN combat SAR; two 1800hp T700-GE-401C turboshafts; length: 50'0"; ff: 8/17/88. POP: 42 [164831/164846, 165120/165123, 165154, 165255/165267]. EH-60H 19?? = Army. Converted EH-60A [86-24561/24574]. YCH-60H 19?? = POP: 1 [95-26673]. HH-60J Jay Hawk 1989 = USCG offshore SAR version of SH-60F; ff: 8/8/89. POP: 42 [163801/163832, 164820/164828, 165096, 165124/165127, 165146/165150] reserialed to USCG [6001/6056] (reason for disparity in numbers unknown). SH-60J, UH-60J 197? = Exports for Japan Ground Self-Defence Forces. MH-60K Black Hawk 1990 = Army Special Ops; T700-GE-701C; ff: 8/10/90. POP: 23. AH-60L Black Hawk 1990 = Army Special Ops. Direct Action Penetrator upgrade of MH-60L. EH-60L Black Hawk 19?? = Conversions from EH-60A. HH-60L Black Hawk 19?? = Army SAR conversions of UH-60L with medical mission equipment. POP: 44. MH-60L Black Hawk 1990 = Army Special Ops. POP: 5 production [93-26467/26469, -26489/26490] plus 3 conversions from UH-60L. UH-60M - Upgrade, cancelled in favor of UH-60L. Designation reserved for use in 2006. HH-60M Black Hawk 19?? = Army, modified UH-60A with medical mission equipment POP: 60. VH-60N White Hawk 1988 = USMC presidential transport, based on HH-60D. POP: 9. UH-60P Black Hawk 1990 = Export to South Korean Army. UH-60Q Black Hawk 1993 = US Army Medevac; ff: 1/31/93. MH-60R Seahawk 2001 = USN; two T700-GE-401C. Remanufactured SH-60B, combining -60B and -60F capabilities; ff: 4/19/2001. POP: 50. SH-60R Seahawk 1999 = USN conversion of SH-60B and -60F with the potential of up to 273 conversions; ff: 12/22/99. NSH-60R 19?? = USN for special testing. Two T700-GE-701C. POP: 64. CH-60S Naval Hawk, Knight Hawk 19?? = USN multi-mission shipboard amalgam of SH-60B and UH-60L. 17pCH; two T700-GE-401C; rotor: 53'8" width: 14'4" length: 50'8". Folding rotor and tail unit. MH-60S Knight Hawk 20?? = USN Medevac and ship supply; replaced H-46D, SH-60B/-F. Two T700-GE-401C. POP: 48. HH-60T, MH-60T Jayhawk 20?? = Two T700-GE-401C. 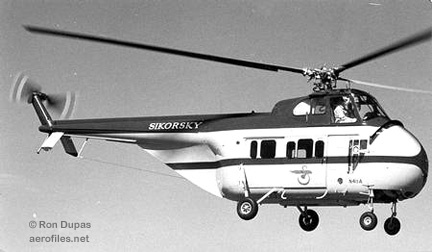 H-76 - Reportedly was Sikorsky Co paper designation for S-76. H-92 19?? = USAF strategic airlift and supply. 22pCH; rotor: 56'4" width: 17'3" length: 56'2" v: 174/151/0 range: 547. Loadable with folding rotor and tail pylon into a C-5 or C-17. 10000# external cargo hook. HJS (Model S-53) 1947 = USN version of S-53; 525hp Continental R-975-34; rotor: 49'0" v: 110/x/0; ff: 8/22/47. POP: 2 as XHJS-1 [30368, 30370]. HNS 1941 = USN version of VS-316A Hoverfly; 180hp Warner R-550-3; rotor: 38'0" length: 35'5" v: 77/x/0. POP: 3 YR-4Bs and 22 R-4Bs transferred from USAAF as HNS-1 [39033/39052, 46445, 46699/46700, 75727/75728]. SEE ALSO H-4. HO2S 1945 = USN version of S-51 Dragonfly; 450hp P&W R-985-AN-5; rotor: 48'0" length: 41'10' v: 93/x/0. POP: 2 YR-5A transferred from USAAF as HO2S-1 [75689/75690], then in 1946 they were handed over to USCG as HO2S-1G. HO3S 1946 = Similar to USAF R-5F; P&W R-985-AN-5; rotor: 49'0" length: 41'1", v: 105/x/0. POP: 92 as HO3S-1 [57995/57998, 122508/122529, 122709/122728, 123118/123143, 124334/124353], of which 9 transferred to USCG [1230/1238]. HO3S-2 - Designation reserved for a USN version of H-5H; not used. XHO3S-3 1950 = POP: 1 HO3S-1 fitted with a different rotor. HO4S 195? = USN from S-55; P&W R-1340-57; rotor: 53'3" length: 42'1" v: 115/x/0. POP: 10 as HO4S-1 [125506/125515]. HO4S-2 - Projected version for USCG was not proceeded with. HO4S-3 195? = Wright R-1300-3. POP: 79 [133739/133753, 133777/133779, 138494/138529, 138577/138601] and 2 US Army H-19B transfers [150193/150194]. Redesignated as UH-19F in 1962. HO4S-3G 19?? = USCG version. POP: 30 [1252/1258, 1281, 1298/1310, 1323/1331]. Redesignated as HH-19G in 1962. HO5S 194? = USN version of S-52-2. 4pCH; Franklin O-425-1; rotor: 33'0" length: 28'4" v: 100/x/0. POP: 79 as HO5S-1 [125516/125527, 126696/126705, 128601/128620, 130101/130137], and 8 as HO5S-1G to USCG [1244/1251]. HOS 194? = USN version of VS-316B Hoverfly; Franklin O-405-9; rotor: 38'0" length: 38'3" v: 105/x/0. POP: 3 XR-6As transferred from USAAF to USN as XHOS-1 [46446/46448] followed by 38 Nash-Kelvinator-built R-6A transferred as HOS-1 [75589/75624 and 75729/75730], 27 of which were later were handed over to USCG as HOS-1G. 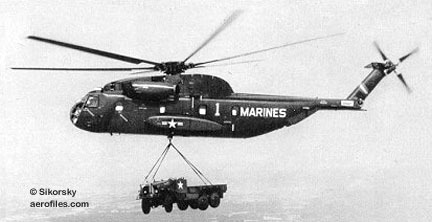 HR2S 1953 = USMC heavy transport version of S-56; two P&W R-2800-54; rotor: 72'0" length: 64'3" v: 130/x/0; ff: 12/18/53. POP: 4 prototypes as XHR2S-1 [133732/133735] and 55 production HR2S-1 [138418/138424, 140314/140325, 141603/141617, 145855/145875]. Redesignated as CH-37C in 1962. HR2S-1W 195? = Early-warning version with a large radar radome. POP: 2 [141646/141647]. HR3S - USMC assault helicopter project, as XHR3S-1, in competition with Boeing-Vertol HRB. 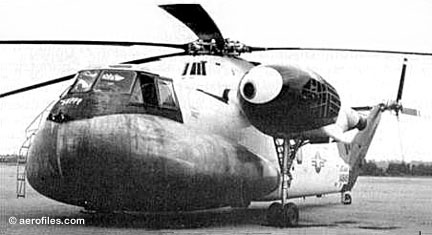 Only a mock-up was built, but the design evolved into CH-3C and civil S-61R. HRS 1953 = USN transport helicopter version of S-55; P&W R-1340-57; rotor: 53'3" length: 42'1" v: 115/x/0. First production as HRS-1, POP: 60 [127783/127842]. HRS-2 19?? = Minor equipment changes. POP: 101 [129017/129049, 130138/130205], of which several were converted to HRS-3 standards. Redesignated as CH-19E in 1962. HRS-3 19?? = Wright R-1300-2. POP: 27 upgraded HRS-2, 4 transferred from USAF, and 103 production [130206/130264, 137836/137845, 140958/140961, 141029, 141230, 142430/142436, 144244/144258, 144268/144270, 144666/144668, 146298/146302, 146439], of which 16 to Spain. Redesignated as CH-19E in 1962. HRS-4 - Planned version for Wright R-1820, none was built. 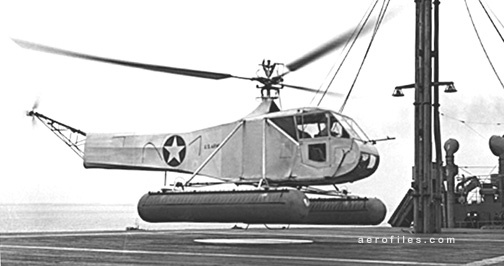 HSS Seabat - USN anti-submarine helicopter based on S-58; Wright R-1820-84; rotor: 56'0" length: 46'9" v: 123/x/0. XHSS-1 1954 = Prototype; ff: 3/8/54. POP: 3 [134668/134670]; later redesignated as YHSS-1. Redesignated as YSH-34G in 1962. HSS-1 1959 = First production; ff 9/20/59. POP: 215 [137849/137858, 138460/138493, 139017/139029, 140121/140139, 141571/141602, 143864/143960. 145660/145669], of which 6 transferred to USAF and in turn to Brazil [60-5424/5429] and 6 to USCG as HUS-1G [1332/1336, 1343]. Redesignated as SH-34G in 1962. HSS-1F 1957 = HSS-1 converted with two General Electric YT58-GE; length of 47'3"; ff: 1/30/57. Redesignated as SH-34H in 1962. YHSS-1N 195? = Night-operations prototype. POP: 1 . Redesignated as YSH-34J in 1962. HSS-1N 195? = Production aircraft. POP: uncertain total, possibly 167 [145670/145712, 147631/147635, 147984/148032, 148934/148963, 149082/149087, 149131/149133, 149840/149842, 150730/150732, 150808/150819, 150821/150822] of which 11 were procured as SH-34Jbatch [150733/150807] might also have been built and the total may or may not include exports to Chile, Germany, Italy, and the Netherlands, as well as some transferred to USAF as HH-34J. 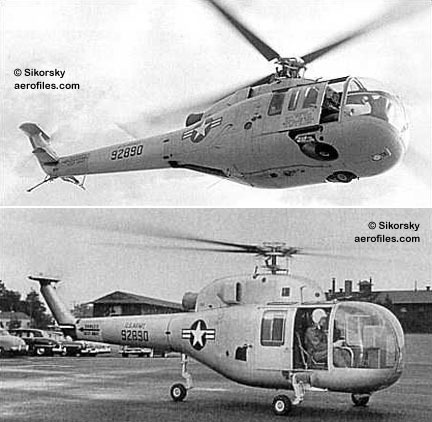 YHSS-2 1959 = A totally different design, based on the civil S-61, with two General Electric T58-GE-6; rotor: 62'0" length 54'9" v: 166/x/0; 3/11/59. POP: 10 [147137/147146]. Redesignated as YSH-34A in 1962. HSS-2 19?? = Two T58-GE-8s. POP: 210 [148033/148052, 148964/149012, 149679/149738, 149893/149934, 150618/150620, 151522/151557]. Production continued as SH-3A and ultimately 245 were built. HSS-2Z 19?? = Ordered jointly by USMC and US Army for use as Presidential aircraft. POP: 8 [150610/150617]. Redesignated as VH-34A in 1962. HU2S, HH-52A 1958 = USCG version of S-62 with General Electric T58-GE-8; rotor: 53'0" length: 44'7" v: 109 mph; ff: 5/14/58. Ordered on 6/21/62 as HU2S-1G, but redesignated as HH-52A on 9/18/62 before delivery. POP: 99 #151; SEE H-52. HUS 1955 = USMC/USCG utility helo version of S-58 with Wright R-1820-84; rotor: 56'0" length: 46'8" v: 123/x/0. POP: 470 to USMC as HUS-1 [143961/143983, 144630/144654, 145713/145812, 147147/147201, 148053/148122, 148753/148822, 149318/149402, 150195/150264, 150552/150580, 150691, 150717/150729]. 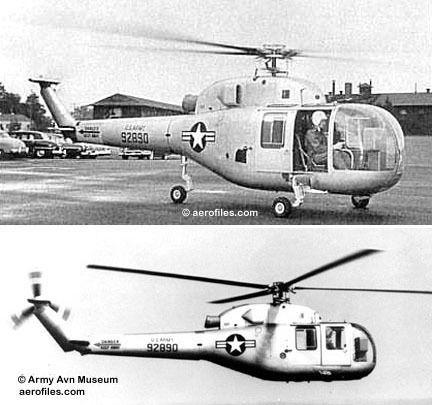 Production continued as redesignated UH-34D after 9/18/62. HUS-1A 195? - Amphibious gear. POP: 8 built [144655/144662] and 32 converted from HUS-1. Redesignated as UH-34F in 1962. HUS-1G 1958 = Converted HSS-1. POP: 6 to USCG [1332/1336,1343]. Redesignated as HH-34F in 1962. HUS-1L 19?? = HUS-1 modified for Antarctic duty. POP: 4 [144658, 145719, 150220, x]. Redesignated as LH-34D in 1962. HUS-1Z 19?? = HUS-1 converted as Presidential aircraft. POP: 8 [147161, 147179, 147191, 147201, 148803, 148804, 148805 and 150691]. 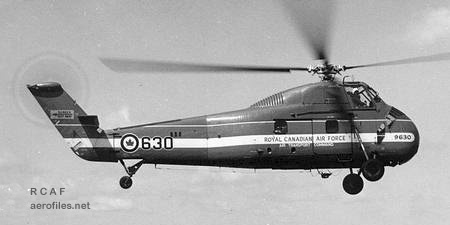 Redesignated as VH-34D in 1962. JR2S 19?? 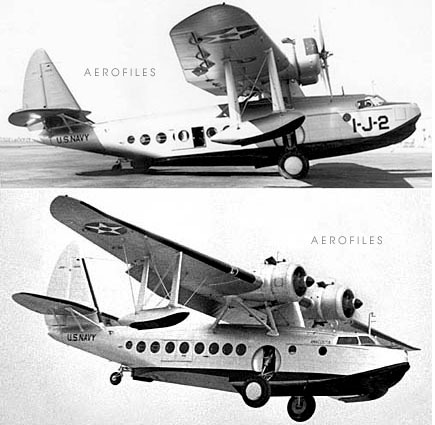 = Three VS-44 Excalibur passenger flying boats for American Export Airlines were completed as XJR2S-1 for the Navy, but flown by AEA under contract; span:	124'0" length: 76'2" v: 227. Civil regs [NC41880/41882] were allocated, as well as USN s/ns [12390/12392] ([04396/04398] were cancelled and possibly refer to the same aircraft). The designation JR2S-2 was used as an alternative. 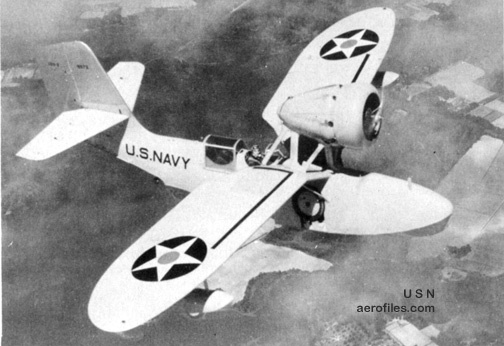 JRS 1940 = USN version of S-43. ChwMAm; two P&W R-1690-23; span: 86'0" length: 52'1" v: 185 ceiling: 20,700'. POP: 17 as JRS-1 [0504/0506, 1054/1063, 1191/1194]. 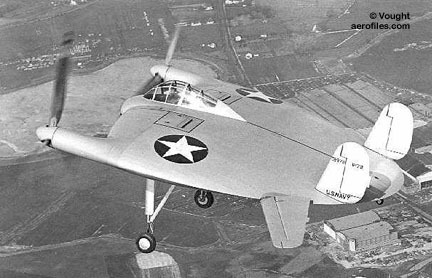 USAAF version as OA-8 and -11. OA-8, -10, -11 1937 = Military use of S-43 for personnel and cargo. 2-12pChwMAm; two 750hp P&W R-1690-23 Hornets; span: 86'0" length: 52'1" v: 185 ceiling: 20,700' (specs similar to S-43). POP: 5 as Y1OA-8 [37-370/-374] and 1 as OA-11 VIP transport [42-01]. USN version JRS. P2S 1932 = 4pOBFb; two 400hp P&W R-985A (?>550hp R-1340) tandem pusher/tractor in interwing nacelle; span: 56'0" length: 44'1" v: 1270 ceiling: 13,900'. POP: 1 as XP2S-1 [A8642]. PBS (Model S-44) 1937 = ChwMFb; four 1200hp P&W Wasps. Essentially USN version of S-36; span: 124'0" length 76'2" v: 227/x/64 range: 4030 ceiling: 20,800'; ff: 8/23/37. POP: 1 as XPBS-1 , sank in San Francisco Bay in 1942. Major elements of design went into VS-44A. PS - USN patrol, based on S-36 and -38. 3-4pO/CswBAm. 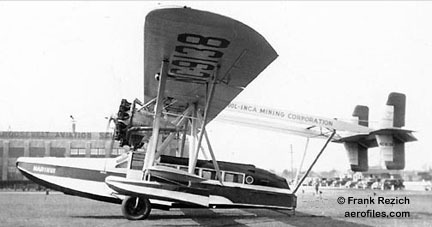 PS-1 1928 = Two 220hp Wright R-790; span: 71'0" length: 36'8" v: 1100 ceiling: 9,000'. POP: 1 as XPS-1 [A8005]. PS-2 1928 = Two 450hp P&W R-1340B: span: 71'8" length: 40'3" v: 1250 ceiling: 19,400'. POP: 2 as XPS-2 [A8089/8090]. PS-3 1929 = Two 450hp P&W R-1340C; span: 71'8" length: 40'3" v: 1240 ceiling: 14,800'. POP: 4 [A8284/8297]. Became RS-3. 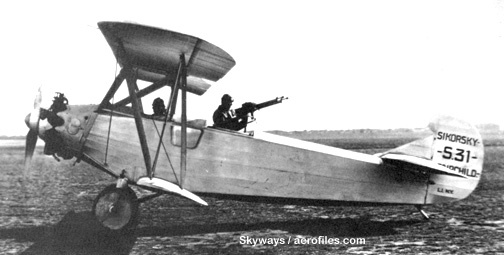 R-4 (Model S-47) - US Army version of Vought-Sikorsky VS-316A. To USCG as HNS, to RAF/RNAS as Hoverfly I.
XR-4 1942 = 165hp Warner R-500-3; rotor: 36'0" length: 35'5" v: 102/85/0; ff: 1/13 (?>14)/42. Igor Sikorsky, Michael Gluhareff. Uncovered fuselage; first tail rotor configuration. POP: 1 prototype [41-18874] was the first helicopter built expressly for military service (USAAF). Became XR-4C in 1943. 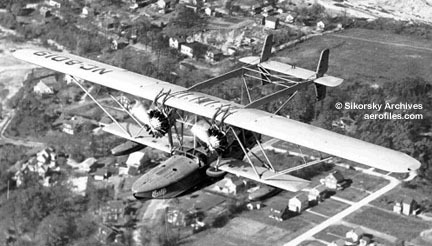 XR-4 was delivered by air with Sikorsky along as a passenger. During the trip, they hovered low to read highway signs and once asked an astonished motorist for directions to the Army airfield. YR-4A 1943 = Service trials with 180hp R-550-1; rotor: 38'0" length: 35'5" v: 75/x/0. POP: 3 [42-107234/107236]. YR-4B, YH-4B 1943 = First production. Bomb racks for anti-sub duty. 180hp R-550-1; rotor: 38'0" length: 48'2" load: 515# v: 75/x/0 range: 130 ceiling: 8,000'. POP: 27 [42-107237/107248, 43-28223/28235, -28247, -47953], of which 3 to USCG and 7 to Great Britain as Hoverfly I. Additionally, 15 were produced for USN as HNS-1. 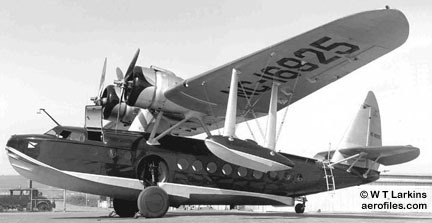 Redesignated as YH-4B in 1948. R-4B, H-4B 1943 = Final variant; 200hp R-550-3. POP: 100 [43-46500/46599], of which 20 (?>22) to USCG as HNS-1 and 45 to RAF. Redesignated as H-4B in 1948. XR-4C 1943 = Larger rotor; 180hp R-550-1. POP: 1 modification of XR-4. R-5, H-5, Hoverfly I (Model S-48, S-51) - US Army general-purpose version of Vought-Sikorsky VS-327. Redesignated as H-5 in 1948. XR-5, -5A 1943 = 4pCH; ff: 8/18/43. POP: 5 [43-28236/28239, -47954], of which 2 were fitted with British equipment and redesignated as XR-5A. R-5A, H-5A 1943 = External litters for SAR duty. POP: 34 [43-46626/46659]. YR-5, -5A 1943 = POP: 26 [43-46600/46625], of which 2 to USN as HO2S-1. Redesignated as YH-5A in 1948. YR-5D, R-5D 1944 = R-5A converted with nose wheel, rescue hoist, and external fuel tank. POP: 21 [43-46606, -46640/46659]. Later redesignated as R-5D, then H-5D in 1948. YR-5E, YH-5E 1947 = Dual controls. POP: 5 modified from YR-5A [43-46611/46615]. 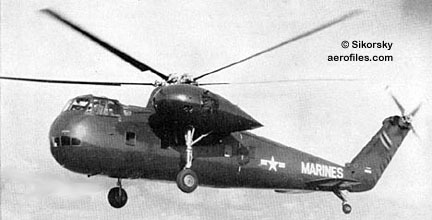 Redesignated as YH-5E in 1948. R-5F 1948 = Military 4p S-51 with nose wheel, 450hp P&W R-985-AN-5; rotor: 49'0" length: 41'1". POP: 11 [47-480/490]. H-5G 1948 = SAR version with hoist. POP: 39 [48-524/562]. H-5H 1949 = Combo wheel and pontoon gear. POP: 16 [49-1996/2100]. R-6, Hoverfly II (Model S-49) - From Vought-Sikorsky VS-316B. Redesignated as H-6 in 1948, to USN as HOS. XR-6 1943 = 225hp Lycoming O-435-7; ff: 10/15/43. POP: 1 prototype [43-47955]. XR-6A 1943 = POP: 5 [43-28240/28244], of which 2 to USN as XHOS-1. YR-6A, YH-6A 1943 = POP: 26 contract-built by Nash-Kelvinator [43-45316/45341]. Redesignated as YH-6A in 1948. R-6A, H-6A 1943 = First production; Lycoming O-435; rotor: 38'0" length: 38'3" v: 960/x/0. POP: 193 [43-45342/45534], of which 36 to USN as HOS-1, and 150 (?>40) to RAF in 1946 as Hoverfly II. This was followed by 5 XR-6As [43-28240/28244]. Two of these went to the Navy as XHOS-1. The YR-6A was identical to the XR-6A except for some minor modifications. On 6/11/48 they were redesignated as YH-6A. R-6A was the production version and 193 were built by Nash-Kelvinator [43-45342/45534]. Of these 36 went to the Navy as HOS-1 and 150 to the RAF. Those remaining in service in 1948 were redesignated as H-6A. R-6B - Cancelled Nash-Kelvinator production. R-7 - Cancelled development of XR-6A. RS - USN and USMC utility transport. 6pO/CswBAm; two 450hp P&W R-1340. RS-1 1933 = S-41 purchased by USN in 1930 for evaluation; span: 78'9" length: 45'2" v: 131. POP: 3 [A8842/8844]. XRS-2 1930 = Redesignation of XPS-2. POP: 2 [A8089/8090]. RS-3 1933 = Two P&W R-1340C; span: 71'8" length: 40'3". POP: 4 redesignations from PS-3 [A8284/8287], plus 1 production for USN [A9055] and 2 for USMC [A8922/8923]. RS-419?? = Impressed Pan American S-38A. POP: 2 [37854/37855]. RS-5 19?? = Impressed Pan American S-41. POP: 2 [37852/37853]. S-29-A 1924 = 16pO/CB; two 400hp Liberty 12; span: 69'0" length: 49'10" load: 4225# v: 115/100/56 ceiling: 12,300'; ff: 5/4/24. Igor Sikorsky. First Sikorsky built in the US, originally had 220hp Hispano-Suizas, but was repowered with Liberty 12s in rebuild after damage in a forced landing . The suffix "-A" denoted "Made in America," as 28 previous S-numbers were all built and utilized in Russia. An historic machine, it was owned by Roscoe Turner and made many long-distance flights in the East and Midwest 1925-27, was even used to deliver two grand pianos. Sold to Howard Hughes' film company in 1928 and appeared as the German Gotha-type bomber in "Hell's Angels" 1930, where it was destroyed in the filmed crash. S-30 1925 - 10pCB; two 200hp Wright J-4; load: 1800# v: 100 range: 500. Data are from an advertisement; the airplane was never built. S-31 1925 = 3pOswB; 200hp Wright J-4; span: (upper) 45'0" (lower) 32'0" length: 26'0" load: 1200# v: 124/110/35 range: 500± ceiling: 15,000'. 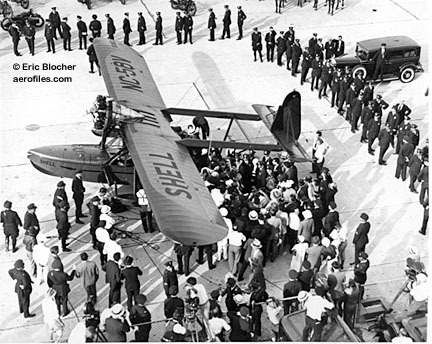 Company's first commercial order was from Fairchild Co, at the time not in the airplane business, for aerial surveying. POP: 1. One publicity photo shows it with a machine-gunner in rear cockpit, suggesting plans for a military export version. S-32 1926 = 5pOswB; 400hp Liberty 12; span: (upper) 58'4" (lower) 38'0" length: 36'0" load: 2100# v: 133/x/40 ceiling: 16,000'. Three cockpits. POP: 1 for a Canadian mining company for use in South American exploration; mounted on floats at one time. 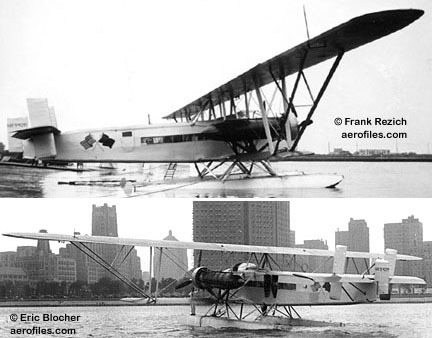 S-33 Messenger 1925 = 1pOswB; 60hp Anzani; span: (upper) 32'0" (lower) 20'0" load: 500# v: 115/x/35 ceiling: 15,000'. POP: 1 racer for Al Krapish. S-34 1927 = 7pOhwMFb; two 200hp Wright J-4; span: (upper) 50'5" (sponsons) 12'0" length: 34'0" load: 1600# v: 111/90/52 range: 360 ceiling: 15,000'. Engines were mounted above the parasol wing. POP: 1 [X883], crash-landed at sea and sank in Nov 1927 after experiencing motor trouble during a test flight. S-35 1926 = 4pCswB; three 420hp Gnôme-Rhône Jupiter (originally had two motors); span: (upper) 101'0" (lower) 76'0" load: 15,710# ceiling: 16,800'; ff: 8/23/26. Original span, before extra bays were added: 76'0"; original load: 6600#. Estimated v: (3 motors) 160/140/59 (2 motors) 135/115/59. POP: 1 built for René Fonck's transatlantic attempt; a twin refitted with three motors at Fonck's request. Overloaded, it crashed on take-off 9/21/26 and burned. S-36 1927 (ATC 2-275) = CswBAm/Fb version of -34 with various seating arrangements, powerplants (usually two 200hp Wright J-4) and specifications; spans: 56'0"-72'0" length: 34'0", the latter span for the long-range version. 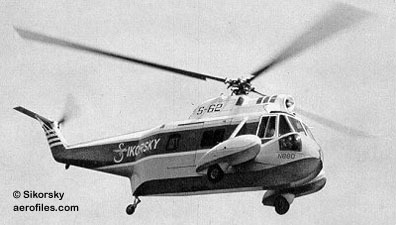 Sikorsky's first amphibian (or as the oft-seen alternate spelling "amphibion"). POP: 5; [NX1282, 3001 (temporary, cancelled), X3699, 4567], and one to USN as XPS-1. S-37-1 Guardian 1927 = 20pO/CswB; two 520hp Gnôme-Rhône Jupiter; span: (upper) 100'0" (lower) 58'0" length: 44'0" load: 7000# v: 135/115/57. 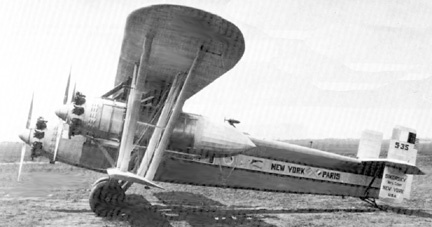 $15,955; POP: 1 for René Fonck as [X1283] Ville de Paris, but his planned flight to Europe was cancelled; ship was sold in 1929 to American International Airways and reregistered [R1283]. Modified as 16p with 525hp P&W Hornet (the Jupiters went to S-37-B) for service in South America; scrapped by PAA in 1930. S-37-2, -37-B) 1927 (ATC 2-170) = 8pOB with two 500hp P&W Wasp; span: (upper) 100'0" (lower) 58'0" length: 45'6" load: 7000# v: 140/120/53 ceiling: 15,000'. POP: 1 [X3698], under a contract from Consolidated Co as their Model 12, for Army evaluation as 5p XP-496 bomber with two 525hp P&W R-1690 (load: 6315# v: 108/x/57 range: 575). Sikorsky amended the suffix to "-B," but while in the service it never did get an official Army designation. 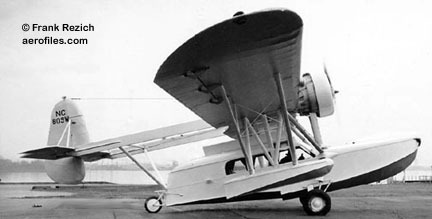 It did not meet Consolidated's requirements, either, and was rebuilt in 1929 by Sikorsky as a 21p transport with two 675hp P&W Hornets, which were replaced by the Jupiters from S-37-1. Rebuilt again and reregistered in 1934 as [NR942M], it crashed at sea in 1934. S-38-A, -B, -C 1928 (ATC 60) = 10-12pCswBAm; two 400hp P&W Wasp; span: (upper) 71'8" (lower) 36'0" length: 40'3" load: 4480# v: 125/103/57 range: 500-700 ceiling: 18,000'. Once was described as "a collection of spare parts flying in formation." POP: 11 [NC8000, NC8005, NC8019/8022, NC8043/8044] 10p prototype [NC5933], subsequent production for airline service, with one special luxury model as a personal transport for John H Whitney [NC8005], 1 to AAF as XC-6, 2 to USN as XPS-2. S-38-AH 1928 (ATC 2-36) = 525hp P&W Hornet A.
S-38-B 1928 (ATC 126, 2-74) = 2-10p with two 410hp P&W Wasp; span: 71'8" length: 40'5" load: 3930# v: 125/110/55 range: 750 ceiling: 18,000'; ff: 3/13/28. $50,000+; POP: 76 [NC1V/3V, NC5V, NC7V, NC11V, NC15V, NC18V/21V, NC23V, NC25V, NC40V, NC73K/75K, NC113M, NC141M/146M, NC158H/160H, NC196H/199H, NC300N/304N, NC306N/309N, NC943M/946M, NC9105/9107, NC9137/9140, NC9143/9144, NC9151, NC9753, NC9775/9776], of which [NC9140] was another -38-B Special with two 450hp P&W Wasp C under (2-74), but crashed before its delivery to Colombia; 3 (?>6) to USN as PS-3. S-38-B Special 1929 (ATC 2-68, 2-69) = S-38-A approved for 11p with 450hp P&W Wasp C [NC9143/9144], and 4p with Wasp SC [NC9137]. S-38-BH 1929 (ATC 356, 2-190) = 10p S-38-B with two 575hp P&W Hornet B; load: 3580# v: 143/120/55 range: 600. $53,000; POP: 2 conversions from S-38-B [NC25V, NC40V] (?>DoC records show as [NC16V] c/n 314-20, [NC17V] c/n 414-8). (2-190) superseded by (356). 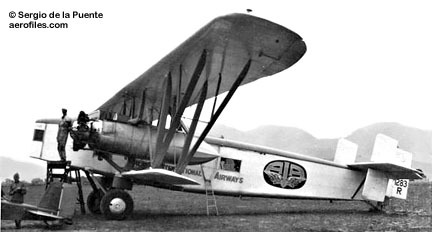 S-38-BL 1932 = Modified S-38-B. POP: 1, [NC24V] c/n 414-15. S-38-BS 1932 (2-434) = 7p with two 450hp Wasp SC. POP: 1 [NC29V] c/n 414-20. 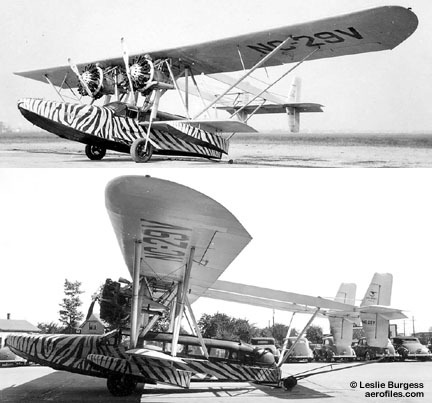 "Zebra" paint job for 1933 African wildlife survey, flown by pilot Osa and photographer Martin Johnson. S-38-BT 1933 (ATC 2-446) = 8-10p with two 525hp P&W supercharged Wasp T. POP: 1 [NC22V] c/n 414-23. S-38-C 1929 (ATC 158) = 8-12pCswBAm; two 420hp P&W Wasp; span: (upper) 71'8" (lower) 36'0" length: 40'3" load: 3630# v: 125/110/55 range: 600 ceiling: 18,200'. $50,000±; POP: 10 [NC4V, NC6V, NC10V, NC26V, NC28V, NC111M/112M, NC160H, NC199H, NC305N]. POP total S-38: 111. S-39, S-39-A 1929 (ATC 340) = 4-5pChwMAm; 300hp P&W Wasp Jr; span: 52'0" length: 31'11" load: 1145-1300# v: 115/97/54 range: 375 ceiling: 18,000'. $17,500; POP: 13 [NC42V, NC802Y, NC803W/809W, X813M=X963M, NC887W], of which the prototype S-39 [X813M] was experimentally converted with two 115hp Cirrus Hermes Mk I [X963M]; crashed during testing. S-39-B 1930 (ATC 375) = 5p "sport" version of S-39-A with a larger rudder. $20,000; POP: 8 [NC50V/51V, NC53V/55V, NC58V, NC888W, NC896W] and 1 to AAC as Y1C-28 [32-411], plus 9 conversions from S-39-A. S-39-C 1931 (ATC 2-391, 2-436) = S-39-B refitted with 400hp P&W Wasp S1. POP: 2 conversions [NC809W, NC1933=NC14326]. S-39-CS Special 1932 (ATC 2-436) = 4p with 375hp P&W Wasp S2. POP: 1, [NC52V] c/n 914, for Osa and Martin Johnson. S-40 1931 (ATC 454) = 44pChwMAm/Fb; four 575hp P&W R-1690 Hornet; span: 114'0" length: 76'8" load: 9252# v: 130/108/65 range: 500-875 ceiling: 13,000'. Hull length 48'0"; ff: 8/31/31 (p: Boris Sergievsky, S Gluhareff) (data from flight report by M Gluhareff, observer). Twin-boom, twin-tail; parasol wing. First of the Pan American Clippers, and world's largest amphibian at the timea wing float alone was as large as a sport flying boat hull and, with its maze of struts, it was nicknamed "The Flying Forest". 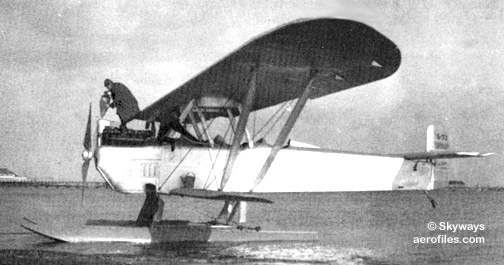 Seaplane version had 11,000# load, slightly higher speed. $139,000; POP: 3 [NC80V/81V, NC752V], c/ns 2000/2002. ALSO SEE The PAA Flying Clippers. S-40-A 1935 (ATC 562) = Conversion of PAA S-40 to four 660hp P&W supercharged Hornets; load: 10,813# v: 140/120/65 range: 900. POP: 3 conversions. S-41-A, -B, -C 1931 (ATC 418, 2-286) = 18pChwMAm; two 575hp P&W Hornet B; span: 78'9" length: 45'2" load: 5700# v: 133/115/66 range: 575-900 ceiling: 13,500'. $62,500; POP: 6. 2 S-41-Bs had modifications as 13p under (2-286) [NC41V, NC60V], 1 converted to S-41-C [NC784Y], 3 to USN as RS-1. S-42, Clipper 1934 (ATC 544) = 37pChwMFb; four 750hp P&W Hornet; span: 114'2" length: 67'8" load: 18,236# v: 188/165/65 range: 1200; ff: 3/29/34. Parasol wing; four passenger compartments. First of the long-distance clipper-type flying boats proved its worth by establishing a new world load-carrying altitude record in lifting a 16,608# load to over 16,000' on 4/26/34 (the mark to beat was 6,561') (p: Boris Sergievsky, Raymond Quick), then increasing this record to 20,407' less than a month later. $197,892; POP: 3 [NC822M/824M] to PAA as Clippers. S-42-A, -B 1935 (ATC 592) = 37pChwMFb; four 750hp P&W supercharged Hornet; span: 118'2" length: 68'0" load: 16,800# v: 188/165/65 range: 1930 ceiling: 16,000'. Parasol wing. POP: 4 S-42-A [NC15373/15376] and 3 S-42-B [NC16734/16736], all to PAA as Clippers. S-43, -43-A, -B, -H 1935 (ATC 593) = 16-25pChwMAm/Fb; two 750hp P&W Hornet; span: 86'0" length: 51'2" load: 6750# v: 194/167/65 range: 775 ceiling: 17,500'; ff: 6/5/35 (p: Boris Sergievsky). POP: 22 S-43 [NC15061/15068, NC16925, NC16928, NC16934, NC20698], 1 S-43-A, 3 S-43-B [NC16926/16927, NC16931/16933], 1 S-43-H [R440]; 5 to Army as OA-8 and 1, an impressed civil model in 1941, as OA-11; 17 to USN as JRS-1. S-43-H went to Howard Hughes for a proposed 1938 world flight; crashed at Lake Mead NV in 1943, repaired and stored at Hughes Tool Co in Houston TX until 1977, then sold to Van Kregten Enterprises of San Jose CA for planned museum display. S-43-W, -WB 1937 (ATC 623) = 19-25pChwMAm/Fb; two 760hp Wright Cyclone; span: 86'0" length: 52'3" load: 6040# v: 186/177/65 range: 775. POP: 4 [NC16929/16930, PKAFT, PKAFU]. 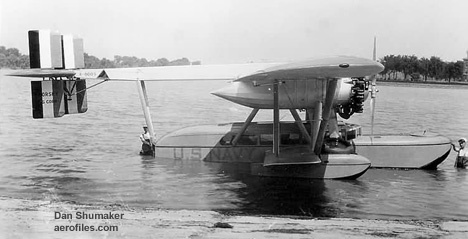 S-43-WB was flying boat conversion. 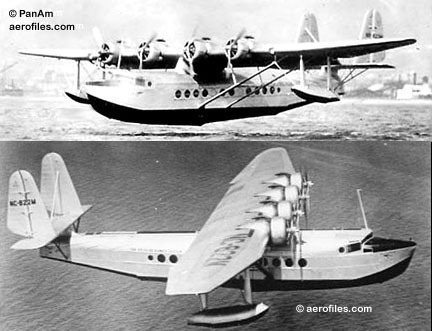 S-45 - Proposed six-engine flying boat for Pan Am. Never built. S-47 Hoverfly 19?? = HNS-1, R-4, VS-316. S-51 (TC H-2) 1946 = 4pCH; 450hp P&W Wasp; rotor: 48'0" length: 57'1" load: 1250# v: 103/85/0 range: 260; ff: 2/16/46. Three-blade main rotor. World's first commercial helicopter, inaugurated Philadelphia's Helicopter Air Transport service. Modified from a military design for the civil market as shuttle, cropduster, surveyor, etc. Prototype for S-53. To USAF as R-5F, and USN as HO3S-1. Licensed production in Great Britain as Westland-Sikorsky Dragonfly (with 520hp Alvis). S-52 1946 = 2-3pCH; 175hp Franklin O-425; rotor: 49'0" length: 28'10" load: 650# v: 110/87/0 ceiling: 14,000'. Known as the S-52-1, development began in late 1945 with a first flight in 1946. Slightly modified to carry four passsengers, four S-52-2s were ordered by the US Army as YH-18A [49-2888/2891] and first flew in July 1950. [49-2890] was later converted as XH-39A and [49-2891] was converted as XH-39. Set world speed and altitude records in 1948. S-53 1947 = Modified S-51 with 525hp Continental R-975-34, tricycle gear, small tail rotor pylon, and a tailplane; ff: 8/22/47. POP: 2 [30368, 30370]. To USN as XHJS-1. S-54 1948 = USAF R-4B modified to the 'sesqui-tandem' configuration once tested on the VS-300, with an open observer's seat added aft of the main rotor. The resulting S-54 was first flown on 12/20/48 and logged about 4.5 hours flying time before being abandoned in early 1949, probably when work started on the S-55. S-55 1953 = Passenger and cargo transport. 12pCH; 600hp P&W R-1340-S1H2; three-blade main rotor: 53'0" length: 42'3" load: 2250# v: 101/85/0 range: 440; ff: 11/10/49. First commercial passenger helicopter, inaugurating New York Airways on 7/8/53. To Army/AF as H-19, USN/USCG as HO4S, USMC as HRS Seabat. Licensed production in Great Britain as Westland Whirlwind, and in France by Sud-Est as Elephant Joyeux. S-55-GW 19?? = 700hp Wright R-1300. S-55-T 1971 = Repowered by Helitec with 840hp Garrett TSE 331-3U-303 turboshaft. S-56 19?? = Passenger and cargo transport. 36pCH; two 2100hp P&W R-2800; five-blade main rotor: 72'0" length: 60'0" v: 130/115/0. Set speed record of 162.64mph on 11/11/56 (p: R L Anderson). To Army as H-37, USMC as HR2S. S-57 - Proposed single-blade, stowing-rotor delta-wing. Not built. S-58A 1955 = Passenger and cargo transport. 12-20pCH; 1275hp Wright C-989HE-2; four-blade main rotor: 56'0" length: 46'9" load: 5370# v: 123/98/0 ceiling (hover) 4,000'; ff (as USN XHSS-1): 3/x/54. Set three world helicopter speed records in 1958 at 141.9mph (100k course), 136mph (500k), and 132.6mph (1000k). POP: unk as S-58A. POP total all S-58s to 1970: 2,261. S-58B 1956 = 1525hp Wright R-1820-84; load: 5150# v: 130/101/0 range: 247 ceiling: 9,500. Army as H-34, USN as HSS, USMC as HUS. S-58BC 195? = Civil cargo and passenger. S-58D 195? = Civil airliner. S-58T (Canada) 1970 = 1800hp P&W PT6T-3 Turbo-Pac coupled-turboshaft conversion. S-59 c.1950 = Turbine-powered S-52/H-18 [49-2890], redesignated as H-39 (qv). S-60 Skycrane 19?? = Concept demonstrator, a modification of S-56. POP: 1. Displayed for many years at New England Air Museum (CT), believed destroyed in a tornado that hit the museum. S-61 - Civil, multi-service, and export CH. Became H-3. S-61A 1959 = Generally similar to SH-3A. POP: 9 to Royal Danish Air Force, 1 to a civil operator. S-61A-4 Nuri 19?? = Export version of SH-3A for Malayasia. POP: 38. S-61F, NH-3A 1965 = US Army/USN; SH-3A with stub wings and two P&W J60 turbojets. Achieved speed of 242 mph. Flown with both five- and six-blade rotors. Fuselage used as ejection system test-bed for S-72 RSRA. S-61L 1960 = 30p non-amphibious commercial version with stretched fuselage; rotor: 62'0" length: 72'10" range: 292. Operated by LA Airways and NY Airways. S-61N 196? = 30p amphibious commercial version with stretched fuselage, much in use as support for offshore oil installations. S-61R 19?? = Civil version of CH-3C. Used by Grumman Corp for many years in support of flight operations from Long Island. POP: 1. S-62 1958 = 10pCH rg; 1250hp GE T-58-8B turboshaft; three-blade rotor: 53'0" length: 44'7" v: 175/x/0 range: 412 ceiling: 11,200'. S-55 rotor system on an amphibious fuselage. Served with USCG, as HH-52A, and some civil operators. Also built under license in Japan by Mitsubishi. S-62A 19?? = Commercial version. S-62C = Commercial version similar to HH-52A. S-63 1958 = S-62 with S-58 rotor system, originally designated S-62B. S-64 Skycrane 1962 = Heavy-lift Skycrane helicopter powered by two P&W JTFD12-4A turboshafts; six-blade main rotor: 72'0" v: 109/x/0 range: 230 ceiling: 9,000'; 5/9/62. Set five helicopter altitude and three time-to-climb records in 1971-72. Army version CH-54. S-64E 196? = Civil version of CH-54A. Capable of lifting cargo weighing up to 20,000#. S-64F 196? = Civil version of CH-54B. S-65 1964 = CH hybrid with a scaled-up fuselage based on S-61R, and its rotor, transmission system, and other dynamic components from S-64. POP: 1 commercial demonstrator, later sold to NASA. Military version H-53. S-65A 1964 = 3-41pCH; two 3925hp T64-GE-413 turboshafts; rotor: 72'3" length: 67'2" v: 196/x/0 range: 257; ff: 10/14/64. S-65C-3 19?? = To Israel Defense Force/Air Force. S-65-Oe 19?? = To Austrian Air Force, but later resold to Israel. POP: 2. S-66 - Proposed AAFS gunship, similar to S-67. Not built. S-67 Blackhawk 1970 = 2pCH rg; two GE T58-GE-5 turboshafts; five-blade main rotor: 62'0" length: 74'4" v: 193/x/0 ceiling: 17,000'; ff: 8/20/70. S-61 rotor system and engines with new gunship fuselage and 27'4" wings. Proposed to US Army as AH-3. Set world 3-5km helicopter speed record of 216.84 mph on 12/14/70 (p: Byron Graham), and 15-25km speed record of 220.89 mph on 12/19/70 (p: Kurt Cannon). Equipped for a time with a fan-in-fin anti-torque device for US Army tests. Destroyed in a crash at 1974 Farnborough air show. POP: 1. S-68 - Proposed Super S-58T. Not built. S-69, H-59 -59B 1973 = Advancing Blade Concept demonstrator with P&W-Canada PT6T-3 Turbo Twin-Pac and two P&W J60 turbojets; two stacked, contrarotating 36' rotors. As a pure helicopter, achieved 184 mph level flight speed, 221 mph in a dive; with auxiliary propulsion, achieved 274mph (?>322mph) in level flight. POP: 2 to Army as YH-59A [73-21941/21942], later to NASA. XH-59B with PT6T-3 and shrouded fan proposed, but never built. S-70 198? = 8-11p executive transport. ALSO SEE H-60. S-70A 1988 = Export Army H-60s as civil designation S-70A-1 to -30 and C-1 to -6. A-1 to Saudi Arabia, A-5 to Philippines, A-9 to RAAF, A-11 to Jordan, A-12 to Japan, A-14 to Brunei, A-16 to Westland, A-17 to Turkey, A-18 to Korea, A-21 to Egypt [88-26121/26122], A-22 to Korea, A-24 to Mexico, A-25/-26 to Morocco, 27 to Hong Kong, A-28 to Turkey, A-29 to Brunei, A-30 to Argentina, C-1 to ROCAF, C-2 to PRC, C-5 to Brunei, C-6 to Colombia. S-70B 19?? 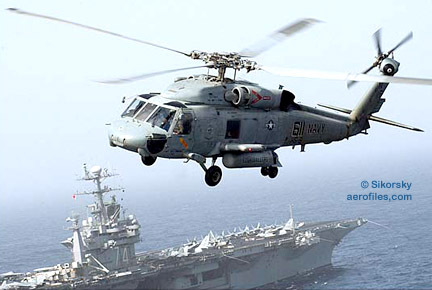 = Derived from USN SH-60B in anti-sub and anti-surface roles, as well as Medevac, SAR, and utility duties. To USCG as HH-60J, to USN as HH-60H, SH-60B, SH-60F/-60FST. Exports to Japan, Hellenic, Thailand, ROCN and RAN. S-71 - Proposal for AAH (won by Hughes AH-64) based upon S-70 rotor system. Not built. S-72, RSRA 1976 = Rotor Systems Research Aircraft built under NASA contract; two GE T58-GE-5 turboshafts; five-blade rotor: 62'0" length: 70'7" load: 3900-5178# v: (helo) 184/160/0 (compound) 361/230/x ceiling: 10,000'. H-3/S-61 rotor system and engines on new fuselage similar to S-67. Crew seated on seats with rocket extraction system (the blades would be blown off at the start of ejection sequence). Could be flown with wings and two GE TF-34s. Was flown in all combinations, even with no tail rotor (NOTAR). POP: 2, with 1 modified as X-wing demonstrator. S-73 - Army Advanced Armored Reconnaissance Vehicle, proposal only. S-74 - Original designation of S-76. S-75 1984 = 2-8pCH with S-76A rotor system and engines on a new carbon-fiber fuselage; two 650hp Allison 250-C30S turboshafts; rotor: 44'0" length: 43'8" load: 2050# v: 159/184/0 range: 398 ceiling: 13,500'; ff: 7/x/84. POP: 2 demonstators built under an Army contract. S-76, H-76 19?? 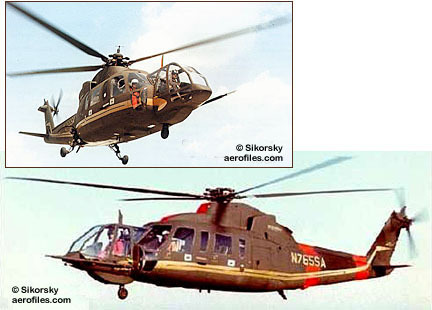 = H-76 is thought to be Sikorsky's own "militarizing" of this model, perhaps for clandestine sales. Original designation was S-74. S-76A 1977 = 14pCH with two 650hp Allison 250-C30; main rotor: 44'0" v: 178/167/0. Set nine speed and two time-to-climb records, and one altitude record in two weight classes over a five-day period in Feb 1982. POP: 284. S-76A+ 1987 = Medical. Retrofitted with two 681hp Turbomèca Arriel 1S. POP: 17. S-76B 1984 = Two 981hp P&W-Canada PT6B-36A/-36B. POP: 96. One modified with nose similar to Boeing-Sikorsky RAH-66 as "Shadow" [N765SA]. Another modified to have a fan-in-fin tail rotor (fantail) as a demonstrator during Comanche development. S-76C 1990 = Two 681hp Turbomèca Arriel 1S1. POP: 43. S-76C+ 1977 = Medical. S-76B airframe. 13pCH with two 856hp Arriel 2S1; length: 52'6" load: (internal) 4813# (external) 3300# v: 181/171/0 range: 505 ceiling: 12,700'. POP: 439. S-76EMS 19?? = Emergency Medical Service. S-78 - Project version of S-70 (H-60) with an enlarged cabin. Not built. S-92 Superhawk 1998 = S-70 growth rotor on a new 19-22p fuselage. CH rg; two GE 1450hp CT7-6D turboshafts with four-blade 56'4" rotors; width: 17'3" length: 56'10" v: 178/160/0 range: 575. Flotation gear for over-water ops. Awarded 2002 Collier Trophy. SS (Model X1200) 1933 = Scout-observation experiment for carrier duty. 2pChwMAm; 550hp P&W R-1340D; span: 42'0" length: 32'0" v: 159 ceiling: 22,600'. Attractive gull-wing design with pylon-mounted engine nacelle. POP: 1 , originally XSS-1, then modified as XSS-2. Standard c.1930 = 2-3pOhwM. 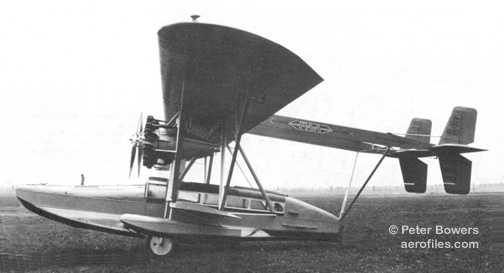 Standard J-1 rebuilt with Sikorsky high-lift parasol wing. [NC6703, X/NX802W, et al]. [X802W] with a Stearman-built fuselage. 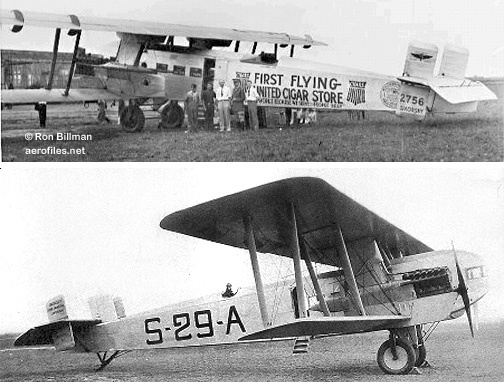 UN-4 1927 (ATC 2-23) = 2pOhwM; 90hp Curtiss OX-5. Modified Curtiss JN-4D fuselage with a Sikorsky-Gluhareff high-lift wing. [C2044, 5469, et al]. Wing adapted for other types, as wellTravel Air, Standard, etc. V-2 1953 - Design study based on S-57; none was built. VS-44A (Vought-Sikorsky) 1942 (752) = 35pChwMFb; four 1050hp R-1830 Twin Wasp; span: 124'0" length: 79'3" load: 27,300# v: 210/175/67 range: 4900 ceiling: 16,600'. Michael Gluhareff. Developed from USN Sikorsky XPBS-1. POP: 3 Excalibur [NC41880], Excambian [NC41881], and Exeter [NC41882]. Excalibur crashed in Newfoundland in Oct 1944. Excambian ended up in Catalina Island (CA) service 1957, then as Antilles Air Boats, retired in 1969 and was donated to the Naval Air Museum at Pensacola FL, finally to New England Air Museum (CT) after rebuild by Sikorsky volunteers. Exeter crashed in Uruguay in Aug 1947. VS-300, -316 (Vought-Sikorsky) 1939 = 1pOH; 75hp Franklin with 28'0" three-blade rotor, single tail rotorlater, after a wind-induced crash, two small horizontal tail rotors were added on outriggers; quad-gear. 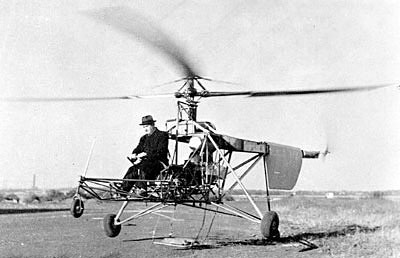 The first successful US helicopter used a Sikorsky-patented single-rotor design of 1931, and had 18 major modifications times during it brief lifespan; ff: (tethered) 8/14/39, (untethered) 11/x/39 (?>5/13/40). POP: 1 [NX28996]. 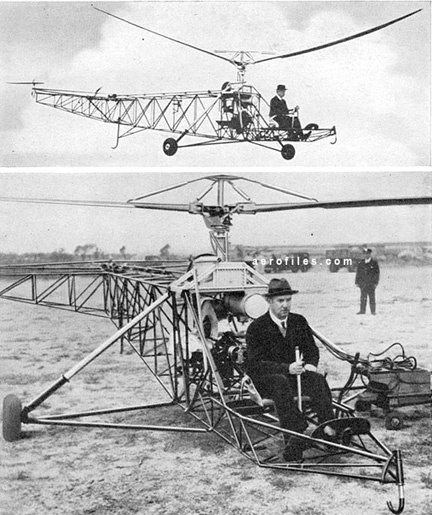 Although the Breguet-Dorand Gyroplane and the Focke-Achgelis Fa.61 were the first helicopters to take-off and land vertically, and hover and fly in any direction, they were essentially experiments. It was VS-300 that paved the way for production models capable of carrying useful loads. 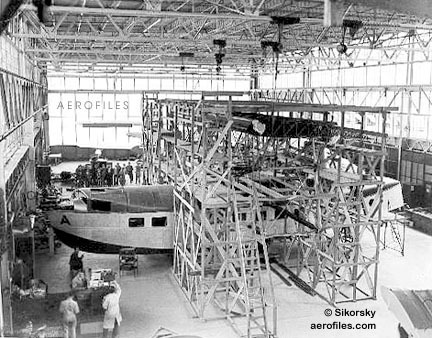 Unlike in Europe, Sikorsky/United Aircraft had a secure industrial base for massive development and production. 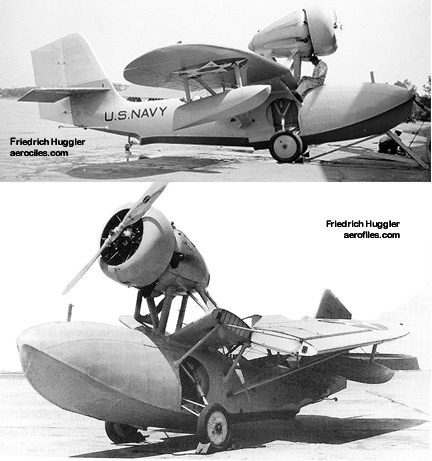 VS-300A (Vought-Sikorsky) 1940 = 90hp Franklin; tri-gear. Able to climb vertically, fly sideways and backward, it could not safely fly forward until 1941. For publicity photos, mechanics changed wheels on the hovering VS300A. Set a helicopter endurance record of 1h:32m on 5/6/41. By Aug 1941, Sikorsky had perfected his two-rotor, cyclical-pitch control system that is still universally used..
VS-315, F5U (Vought-Sikorsky) 1942 = 1pC circular-wing; two 1350hp P&W R-2000-7; span: 32'0" length: 27'10". Used four-blade F4U props. POP: 1 as XF5U-1. Charles H Zimmerman, based on his V-173 concept; nicknamed "Flying Flapjack." Project cancelled in 1947 by the Navy, then favoring development of jets, and was scrapped.